Dynamic Projectionist for the future energy. International Exhibition Expo – 2017 Astana. The EXPO 2017 hosted by Astana, Kazakhstan and is open to the public for 93 days, from 10th June until 10th September 2017, about 3 million visitors will be expected. 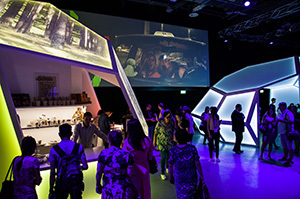 More than 100 countries and international organizations participate and present their achievements, ideas and solutions relating to the exposition’s chosen theme “Future Energy”. 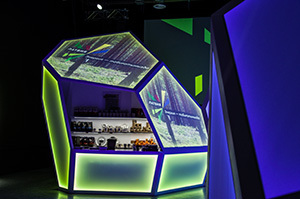 The “Energy in Our Nature” Pavilion of Latvia is presented by advanced technologies, dynamic projections and multimedia exhibits oriented towards the future. The Pavilion guests can feel, see and hear Latvia as if they were visiting the country. Synergy between architecture, art and technologies makes the Latvian Pavilion at EXPO 2017 to memorable experience for Visitors. Our Partner, REVERIE Trading Group Ltd. was appointed to engineer and deliver the complete audio-visual installation and video show direction of the Latvian Pavilion at Expo 2017 Astana. “The technical equipment includes 3 EPSON EB-L1105U laser and 2x EB-G7905U projectors, Wings VIOSO, AVIO and MDC-X media server. The Epson G series is used together with the Mirror Head – MH13, MDC-X2 and JCD boxes. All videos, Mirror Head projections and video walls are synchronized in one 30” show which represents Latvian culture, innovations, education opportunities and main “Energy in Our Nature” ideas” says Mārtiņš Priedītis, CEO of REVERIE Trading Group Ltd. 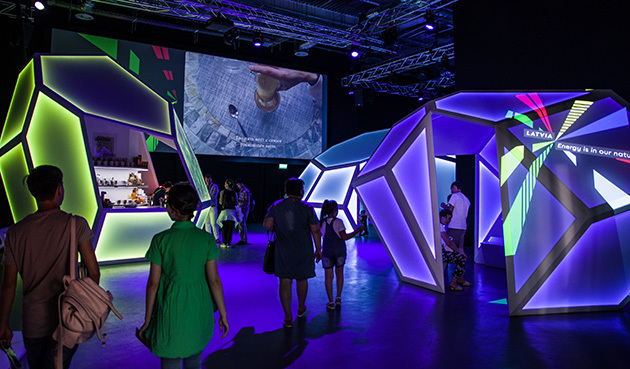 The direction of the Latvian pavilion decided to combine the energy of the future with future technologies. The eye – catching show is introduced by a Mirror Head intro and continues with the Story of future energy in Latvia, considering the people and the events. A final 16 minutes Mirror Head show including projections on the walls, floors and projection mappings on irregular shapes delivers an inspiring visual experience for the entire audience. REVERIE Trading Group Ltd. is one of the first developers of creative audiovisual presentations and interactive technology in the Baltics. It provides audio-visual systems integration, offers interactive multimedia solutions, digital media content creation and is supplier for conference, control and presentation equipment. In 2016 REVERIE became a distribution partner of our products in the Latvian market. Since then it has provided high professional assistance for our customers in the area. Since 2009, the company formed by a creative and ambitious team of professionals is one of the leading representatives of communication Industry in Latvia and the Baltic States. Innovative and creative approach, effective solutions – One-stop-shop principle – transparent policies and customer loyalty are key points for the company’s success.